Hydropower is one of the first issues being considered by the 115th Congress. In mid-March, the U.S. House of Representatives and U.S. Senate both held oversight hearings on the future of hydropower development. On April 26, 2017, the House Committee on Energy and Commerce released ten draft bills covering a variety of issues related to hydropower. These bills include the Hydropower Policy Modernization Act of 2017, which includes many hydro provisions proposed as part of the energy bills approved by the Senate and House in the last Congress, and bills to promote hydropower development at existing non-powered dams, closed-loop pumped storage projects, and small conduit projects. On May 3, 2017, the House Committee on Energy and Commerce’s Subcommittee on Energy will hold a legislative hearing to discuss these draft bills. The hearing will be held at 10:00 am in Room 2123 of the Rayburn House Office Building in Washington, DC. Also on May 3, 2017, the House Committee on Natural Resources, Subcommittee on Water, Power and Oceans will hold an oversight hearing titled “The Challenges of Keeping Hydropower Affordable and Opportunities for New Development.” The hearing will be held at 2:30 pm in Room 1324 of the Longworth House Office Building in Washington, DC. On April 18, 2017, in Catskill Mountains Chapter of Trout Unlimited, Inc. v. EPA, the U.S. Court of Appeals for the Second Circuit denied requests for rehearing and rehearing en banc of its January 8, 2017 decision reinstating the Environmental Protection Agency’s (EPA) Water Transfers Rule. The rule, adopted in 2008, codifies EPA’s longstanding policy that water transfers between navigable waters that do not subject the water to an intervening industrial, municipal, or commercial use do not constitute an “addition of pollutants” to navigable waters and are not subject to National Pollutant Discharge Elimination System (NPDES) permits under section 402 of the Clean Water Act (CWA). The Second Circuit reversed a decision of the U.S. District Court for the Southern District of New York which vacated the rule on the basis that it was an unreasonable interpretation of the CWA. Plaintiffs have until July 17, 2017 to file a petition for a writ of certiorari with the U.S. Supreme Court. The lower court’s decision raised concerns for the hydropower industry because reversal of the rule could have ultimately subjected certain dams involving transfers of water between water bodies to NPDES permitting. The Second Circuit’s decision has removed that uncertainty. The Second Circuit’s opinion also expressly preserved longstanding precedent that hydropower dams are generally not subject to NPDES permits, holding that these cases “have no bearing on the outcome of this appeal.” The Second Circuit’s decision is also consistent with the 11th Circuit’s decision upholding the rule, thus foreclosing a conflict among the federal circuits. 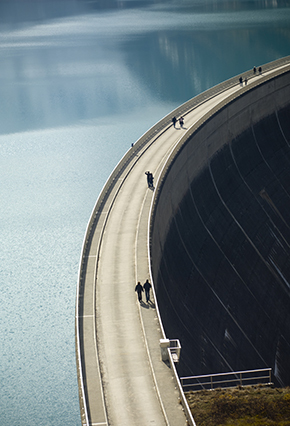 Van Ness Feldman authored an amicus brief for the hydroelectric industry urging the result reached by the Second Circuit. For more information, see our January 23, 2017 alert. On April 3, 2017, the U.S. Court of Appeals for the Fourth Circuit affirmed a U.S. District Court order holding that Alcoa Power Generating, Inc. (Alcoa), former licensee for four hydroelectric developments over a 45-mile stretch of the Yadkin River in North Carolina (Alcoa recently transferred the license to Cube Yadkin Generation LLC), holds title to the riverbed underlying the projects and their reservoirs. In 2015, the District Court rejected the State of North Carolina’s claim of title to the riverbed on the basis that the river was navigable at statehood in 1789 and that Alcoa has only been using the riverbed with its permission, which it was revoking. The District Court also held that Alcoa had shown good title to the riverbed. In a 2-1 decision, the Fourth Circuit held that there was no clear error in the District Court’s decision on those matters. The State of North Carolina filed a timely Petition for Rehearing En Banc on April 17, 2017, and American Whitewater filed an amicus brief in support of the State’s Petition on April 24, 2017. On April 4, 2017, in a CEO Town Hall on the American Business Climate at the White House, President Trump praised dams and hydropower as infrastructure projects that are ripe for permitting relief. The President stated that hydropower is a “great, great form of power” and “one of the best things you can do.” He added that duplicative and multi-agency red tape should be minimized. On April 19, 2017, nine Democratic members of the House Energy and Commerce Committee sent a letter to the Government Accountability Office (GAO) requesting the GAO to undertake a review of FERC’s dam inspection process and the role of FERC’s Division of Dam Safety and Inspections in evaluating dams and related structures during the hydroelectric relicensing process. GAO’s request was prompted by the recent spillway failure at Oroville Dam in California. The representatives identified several specific issues to be considered by the GAO, including policies and procedures regarding consideration of dam safety in relicensing; what analytical tools are used to evaluate dam performance; consideration of the potential impacts of climate change and other natural events on dam safety; dam safety criteria and reporting requirements; remedial requirements, including timelines; and the respective roles of licensees, states, and FERC in the evaluation of structural integrity and performance. The specific scope of work and the timeframe for the GAO’s analysis are to be determined. On April 14, 2017, FERC issued notice that pursuant to National Archives and Records Administration procedures for appropriate handling of documents, it will follow the controlled unclassified information (CUI) labeling system for submission or filing of sensitive material. Under the procedures, filers of documents containing Critical Energy/Electric Infrastructure Information (CEII) or information recognized by FERC’s regulations as privileged or within the scope of protective orders and agreements (PRIV) are directed to include a header on each page of such a filing identifying that it contains CUI and the appropriate FERC designation for the sensitive material, i.e., CUI/CEII, CUI/PRIV, or CUI/CEII/PRIV. Filers of CEII are reminded to follow the CEII-specific filing requirements adopted by FERC in November 2016 in response to the Fixing America’s Surface Transportation Act and to clearly identify specific pages in a document containing privileged materials. Effective April 5, 2017, the Council on Environmental Quality (CEQ) withdrew its “Final Guidance for Federal Departments and Agencies on Consideration of Greenhouse Gas Emissions and Effects of Climate Change in National Environmental Policy Act Reviews.” (GHG Guidance). The GHG Guidance, issued by the Obama administration on August 5, 2016, directed federal agencies, when conducting environmental reviews under the National Environmental Policy Act, to consider the potential effects of a proposed action on climate change by assessing GHG emissions and the effects of climate change on a proposed action. However, on March 28, 2017, President Trump issued Executive Order 13783, “Promoting Energy Independence and Economic Growth,” which, among many other things, directed CEQ to rescind the GHG Guidance in the context of a wide ranging review and reconsideration of Obama administration actions to improve environmental protections. On April 17, 2017, FERC staff issued a new Hydro Primer, a handbook of hydropower basics. The Primer provides an overview of FERC’s role in regulating non-federal hydropower in the United States, explains the different types of hydropower projects and the resources they affect, explains the regulations and statutes applicable to the hydropower program, and provides an overview of how the public and agencies can participate in the program. It also describes FERC’s Office of Energy Projects and the three divisions that oversee hydropower, including the Division of Hydropower Licensing, the Division of Hydropower Administration and Compliance, and the Division of Dam Safety and Inspections, that coordinate to process license applications, oversee license compliance, and ensure dam safety. The Primer contains useful information and graphics and should be a resource for all entities involved in the hydropower program.